The new German Empire was proclaimed in 1871 and in the two decades that followed – before it embarked in the late 1890s on construction of the second-largest navy in the world – the Imperial navy was a small one. Its ships were however active in many parts of the globe. 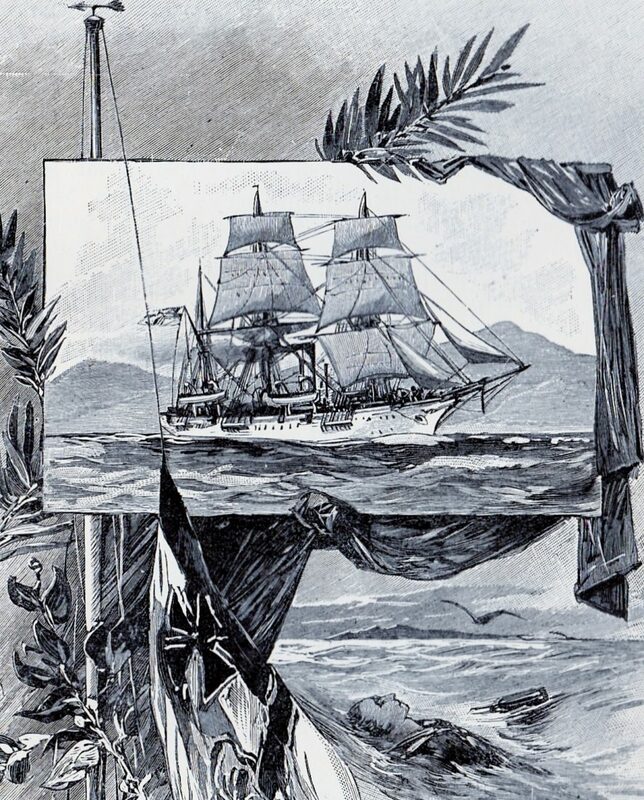 This was in support of efforts to establish colonies overseas and to protect German commercial interests in the Far East.One of the vessels so involved was the small gunboat SMS Iltis (1880) which was to have a very active career – one which included such a surprising event as a confrontation between Germany and Spain that was only solved by Papal intervention. Commissioned in 1880, the Iltis was a typical small gunboat of a type common in many navies of the time and suited to interventions in remote colonial areas. Of 560 tons and 155 ft overall she had a single 142 hp engine that gave her a maximum speed of eight knots. Considered to be a good sea boat, the Iltis carried a barquentine rig – a significant advantage when operating far from coaling stations. To minimise drag when under sail her propeller could be hoisted. She was more than adequately armed for what was expected of her – two 125 mm and two 87mm breech-loaders, supplemented by two 37 mm revolvers (essentially like overgrown hand guns). She carried a crew of 85. The Iltis’s first assignment was to Germany’s “East Asia Station” and she was to remain in eastern waters for almost five years. As Germany had no naval base in the Far East at that time the Iltis seems to have mainly operated out of the British possession of Hong Kong. Germany had come late to acquisition of colonies but considered them essential as much for prestige reasons as for economic purposes. With major portions of the globe already occupied by other colonial powers, Germany found herself seeking opportunities in some unlikely places, not least in New Guinea and in island groups in the Pacific. Small gunboats such as the Iltis were important tools in this process. In the early 1880s German ambitions focussed on creation of a colony in Northern New Guinea. This consisted not only of the northeastern part of this vast island but of the nearby islands of the Bismarck Archipelago and of the North Solomon Islands. No other nation body protested the acquisition of these areas but the situation was different as regards the Carolines, a widely scattered archipelago of tiny islands some seven hundred miles to the north of New Guinea. The Carolines had been claimed by the Spanish in the 17th Century and known as Las Nuevas Filipinas. Though in theory governed from Manila in the Spanish colony of the Philippines there was no attempt to settle the Carolines and missionary efforts had been resisted by the Micronesian inhabitants. Spain formally reasserted her rights in 1875. A decade later Germany, now an ascendant and growing power, decided to seize the islands – and this is when the Iltis played her part. 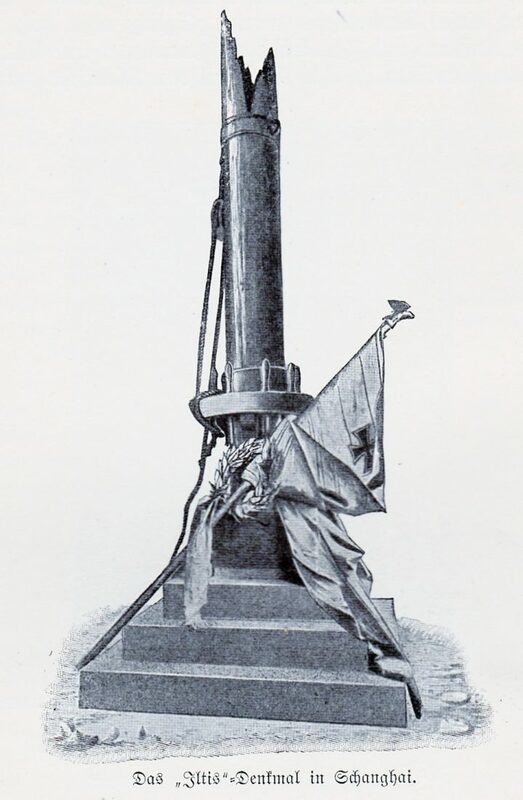 In early August 1885 the Iltis, then at Shanghai, was instructed to proceed to the Carolines, hoist the German flag there, and present the Spaniards, and the world, with a fait accompli that would claim them as German territory.Putting in at Hong Kong to take on coal, information was received that two Spanish ships were en route for the same purpose. A race was now on to claim possession. Speed was now of the essence and by hard driving the Iltis reached Yap, in the Western Carolines, by the 25th of the month. Wasting no time, her captain, KptLt. Hofmeier, went ashore immediately, raised the black-white-red German flag and formally claimed the islands. The Spanish had lost the race. The scene was now set for an international confrontation, one in which the weak Spanish Empire would certainly come off badly if it came to war. Spain did not back down however and took a step which might have seemed normal several centuries earlier, but which was unexpected in the late nineteenth century – they appealed to the Pope. This was a master-stroke. 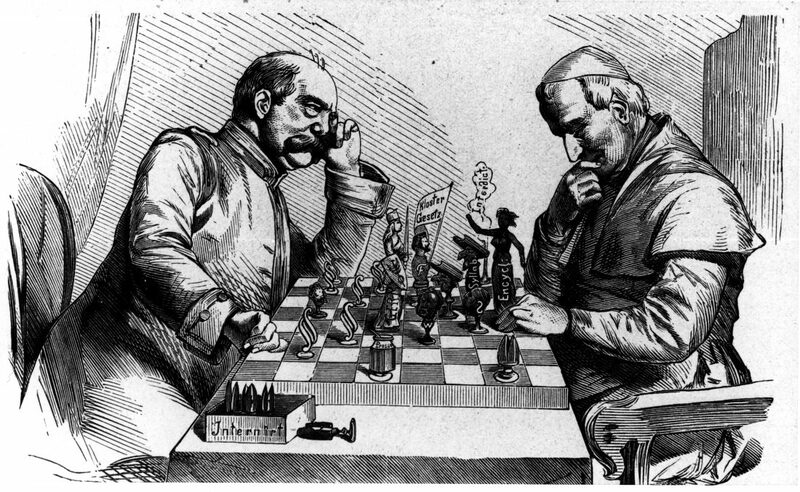 In the early years of the new German Empire the anti-Catholic Kulturkampf (Culture War), a series of restrictions on the role of the Church initiated by the chancellor, Otto von Bismarck, had led to fraught relations with the papacy. 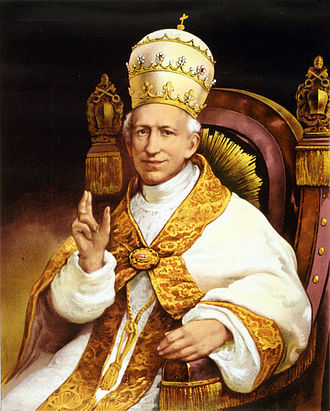 Leo XIII, who had succeeded to the papal throne in 1878, was however eager to end the struggle and this was in Germany’s interest as well, given the large percentage of its population that was Catholic. Submission of the Carolines issue for arbitration was a gesture of reconciliation and when Leo ruled in Spain’s favour Germany accepted the decision without protest and evacuated the islands. She was however awarded face-saving trading and plantation rights. The Spanish did indeed settle the islands from 1886 onwards but their tenure was to be brief. In 1899, in the aftermath of the Spanish-American War, and its loss of the Philippines, Spain sold the islands to Germany. This tenure was also to be brief – Japan was to occupy them at the start of WW1 and they were to see bitter fighting in WW2. Today they are divided between the Federated States of Micronesia in the east and Palau in the west. The Iltis returned to Germany in 1886 for a complete refit. She sailed back to the Far East the following year. For the next decade she was engaged in an endless and busy round of trade protection and flag-showing assignments in China, Korea and Japan. 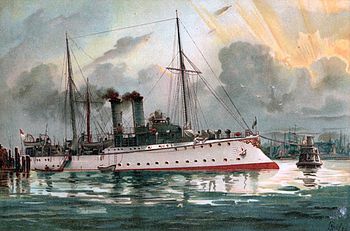 In 1891 she cooperated with French, British and American gunboats on the Yangtse to protect western interests during widespread unrest. Four years later, during the Sino-Japanese War, she was to rescue Chinese survivors from a transport sunk off Korea by the Japanese. Thereafter she steamed to Formosa – now Taiwan – where Chinese forces were unsuccessfully resisting Japanese invaders, once more to provide protection for German lives and property. In the process the Iltis was to fire her guns in what might have been the only time she did so in anger, hitting a fortified Chinese position with three shells. The Iltis’s days were now numbered. On 23rd June 1896 she was caught in a typhoon off the Chinese coast. Her engine strained at full power to keep her off the reefs of a lee shore but the effort was unavailing and she struck around midnight. The engine room was immediately filled with water and the boiler fire was extinguished, leaving the vessel wholly helpless. She broke amidships into two parts, initially held together by rigging. 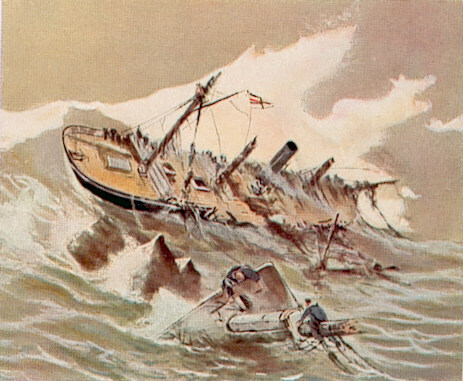 Some of the crew managed to hold on in the forward section – it remained lodged on the reef – but all but two of those on the after part died when it tore free and capsized. The survivors, eleven out of eighty-eight on board, were finally rescued by local villagers. The captain and all the officers died. The loss of the Iltis caused considerable shock in Germany, the more so since the new Kaiser, Wilhelm II, was volubly “naval minded” and the empire was now embarked on creation of a large navy. Memorials to the crew were erected on the Bund in Shanghai (is it still there?) and in Kiel in Germany. The Iltis of 1880 had provided sterling service over hundreds of thousands of miles steaming and sailing and had provided invaluable training for the officers and men of the growing navy. The name Iltis was to be kept alive by a new – and much more sophisticated – gunboat launched in 1898, which was also to see active service in the Far East, in the Boxer Rising in 1900 and in the defence of Tsingtao in 1914. But that’s another story!